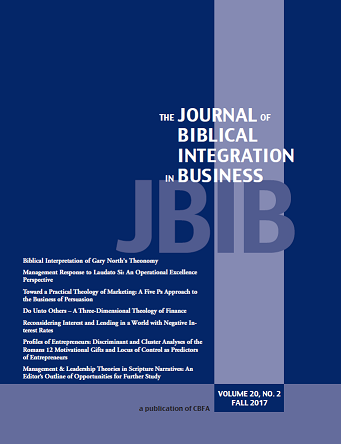 The purpose of this quantitative exploratory research was to conduct discriminant and cluster analyses to see if the Romans 12 motivational gifts and locus of control predict membership in the entrepreneurial member group and consequently discover motivational gift profiles of entrepreneurs. Four hundred business leaders participated. Both hypotheses were supported, revealing all seven motivational gifts predicted those who were entrepreneurial and those who were not. Five distinct entrepreneurial motivational gift mixes/profiles were established.